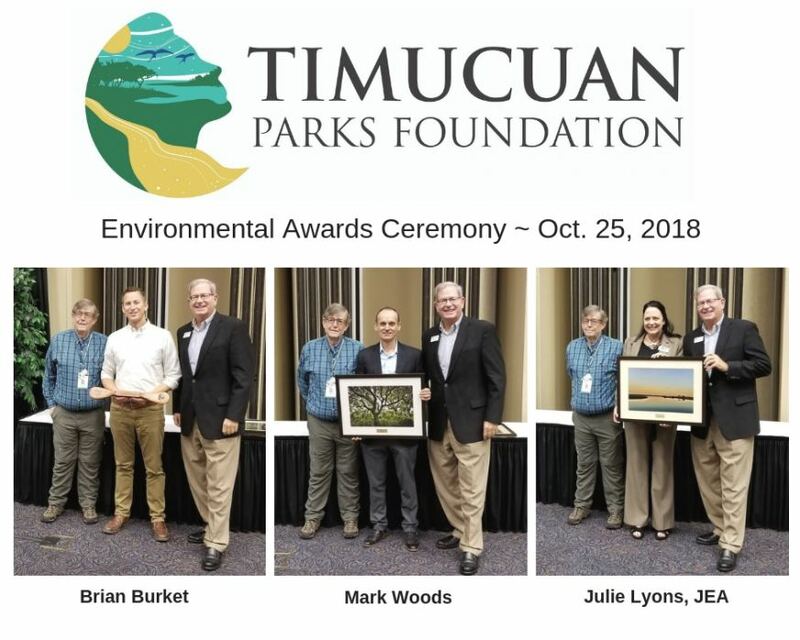 JACKSONVILLE, Fla. - Oct. 30, 2018 - PRLog -- Timucuan Parks Foundation joined the City of Jacksonville for the 26th Annual Environmental Awards Ceremony. During the ceremony held at University of North Florida's Adam W. Herbert University Center, TPF presented three awards to two individuals and one company who greatly contributed to our local preservation parks throughout the year. The 2018 Willie Browne Stewardship Award was presented to Brian Burket with the City of Jacksonville's Parks, Recreation and Community Services Division. The 2018 Kathryn Abbey Hanna Award of Merit was presented to Florida Times-Union Columnist Mark Woods and the 2018 Volunteer of the Year Award was presented to JEA. "I am honored to present these awards to these champions of our preservation parks," said Mark Middlebrook, executive director of TPF. "Our success in supporting our first-class network of parks and preserves depends greatly on our park partners, volunteers and the community." Burket is the first recipient of the foundation's newly renamed Willie Browne Stewardship Award. Burket serves as the waterfront projects manager for Jacksonville and has worked to integrate the city's parks, preserves and waterways into the fabric of the community. He believes developing high quality outdoor recreation experiences will create new stewards for public lands and waterways so they are protected for future generations to enjoy. "The City's parks department today, from top to bottom, is the best I've seen in the 35 years I've lived in Jacksonville," said Middlebrook. "Brian is emblematic of the professionalism and dedication I see every day." The Kathryn Abbey Hanna Award of Merit was given for the first time to Woods for his work featuring National Parks and for his passion for the outdoors and local preservation parks. Since joining the Florida Times-Union in 2003, Woods has written numerous columns about the natural environments across the region and the country. Woods received the Eugene C. Pulliam Fellowship in 2011 and spent a year examining the future of National Parks, which resulted in his 2016 book, "Lassoing the Sun – A Year in America's National Parks." "Mark has become a respected voice in the national debate on the future of our National Parks. His concerns about the need to maintain, protect and expand our National Parks are the same issues that confront Jacksonville's preserves and conservation areas," said Middlebrook. TPF chose JEA for the Volunteer of the Year Award for their extraordinary contribution to the beautification and maintenance of the Timucuan parks and preserves. Last summer, JEA volunteers, including their summer co-op interns, volunteered more than 150 hours at the national, state, and city preservation parks throughout Jacksonville on projects ranging from shoreline cleanup to trail maintenance to invasive plant removals. "JEA employees have become essential elements of our successful park system and we appreciate JEA affording the opportunity to their employees to give back and engage with the community," said Felicia Boyd, TPF program and outreach director. "JEA's community engagement team are always professional, enthusiastic, and hard-working and we have enjoyed working with them. Our parks cannot survive without our volunteers." TPF, along with its other non-profit partners, organizes thousands of hours of volunteer efforts every year to help local parks and preserves keep a high standard for visitors. TPF added the Volunteer of the Year Award and the Kathryn Abbey Hanna Award of Merit this year. Hanna Park, Jacksonville's signature oceanfront park, is also named in her honor. Hanna was a distinguished professor, historian and conservationist who wrote several books about Florida. She also served as chair of Florida's Board of Parks and Historical Places and chaired Florida State University's Department of History for 15 years. Timucuan Parks Foundation renamed the stewardship award this year for Willie Browne. Browne's father gave him 600 acres of hardwoods and wetlands in the center of Ft. Caroline at the age of 16 on the condition he maintain it in its natural state. The gift to Browne at "such a young age instilled the responsibility and value of wildlife conservation," says the National Park Service, which now owns and manages Browne's property known as the Theodore Roosevelt Area.